The actual progress scene of the south-west monsoon is hazy and unorganised to some extent as on todays synoptic situation. 1. While the ICTZ has moved north a bit, and is roughly around the 2N line now, clouds are seen along this line and a band stretches from south Arabian sea to south of the bay. 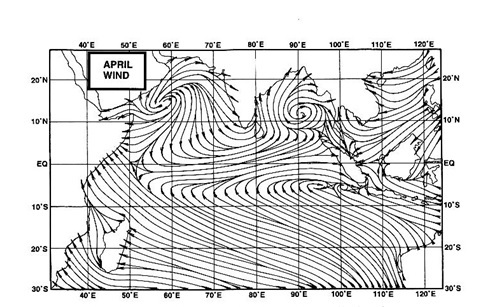 this is seen in the wind direction just above the equator, south of India, in the streamline map. The two maps can be compared. The north-westerlies from the Arabian Sea along the western region of India curve at the tip of the Indian peninsula and blow as southerlies along the east coast and as south-westerlies into the south Andaman Sea. But this is a result of the trough / wind discontinuity at 0.9 km a.s.l. from Jharkhand to south Tamil Nadu now running from Chattisgarh to south Tamil Nadu through Telangana and Rayalaseema. Now, this trough has to fizzle out to allow the monsoon to gain current in the south bay. International models now predict the rains, and wind to strenghten in the south Andaman Sea from the 17th. 2. Extreme heat wave conditions are to repeat high temperature readings in the northern belt of the sub-continent from tomorrow, the 14th. Rajasthan readings are likely around 46-48c in the next 2 days and other heat wave prone regions like Vidharbha. Heat is then likely to spread to the east. 3 stations in Sindh have recorded 50c today including Larkana and Jacobabad. This is due to the high "aloft" today over the Sindh region, and which is expected to cover a larger area eastwards from tomorrow, as a result of which the heatwave will creep into India. The monsoon low which has started forming in Rajasthan a few days ago, still has the core pressure remaining around 1000mb. Now, this monsoon low has a long way to go, with the core presuure area to ultimately be at 994mb, which should elongate and spread westwards into the Arabian region.